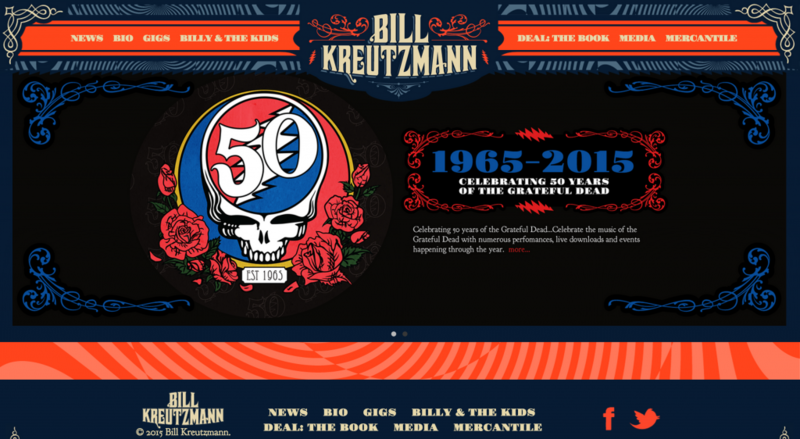 When legendary Grateful Dead drummer, Bill Kreutzmann, came to us for a new website we were thrilled to oblige. His old site was outdated and the functionality was wonky. Working with designer Justin Helton of Status Serigraph we achieved both a beautiful aesthetic that playfully reminds the user of Mr. Kruetzmann’s psychedelic roots, while creating a site that also provides modern architecture and user experience best practices. With a surge of upcoming activity, including a nationwide book tour and a 5 sold out Fare The Well concerts celebrating 50 years of the Grateful Dead, in addition to a variety of other creative endeavors, Bill’s site now easily displays news, events, shows, music samples and more. This entry was posted in development, portfolio, project management, user experience. Bookmark the permalink. ← Owens, Sneller, Pinzelik, Wood & Schaff, P.C.